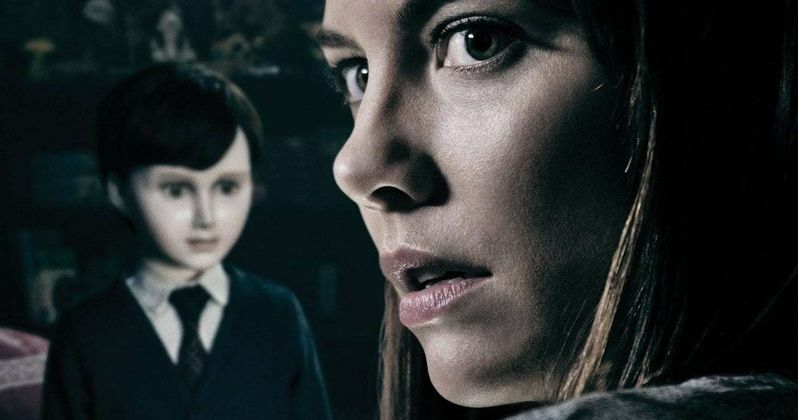 The Boy 2 is officially happening. STXFilms is partnering with Lakeshore Entertainment on the follow-up to the 2016 horror flick that centered on a spooky lifelike doll. The sequel will see Katie Holmes (Dawson's Creek, Logan Lucky) in the lead role. The Walking Dead star Lauren Cohan fronted the original. The sequel will tell a new story centering on new characters, save for the creepy doll Brahms, who will be back once again. The sequel to the 2016 horror movie The Boy will follow a family who movies into a new home, unaware of its haunting past. Katie Holmes will play a character named Liza. Her son will make a strange new friend in the form of the aforementioned, creepy, lifelike doll named Brahms shortly after they move in. Horror happenings ensue. Holmes isn't a total stranger to the horror genre, having previously starred in 2010's Don't Be Afraid of the Dark. Early in her career, she starred in the teen thriller Disturbing Behavior. William Brent Bell will return to the director's chair for The Boy 2 following the success of the first movie. Bell also directed the horror flick The Devil Inside. The script for the sequel comes from Stacey Menear, who also penned the previous movie. It appears as though the studio largely wants to keep the same creative team in place. Tom Rosenberg, Gary Lucchesi and Eric Reid will producer for Lakeshore Entertainment, alongside Matt Berenson, Jim Wedaa and Roy Lee. Lakeshore Entertainment's Gary Lucchesi has this to say about The Boy 2 in a statement. "Following the success of The Boy, we are thrilled to be working on the next chapter of this chilling Brahms story with Stacey and William." 2016's The Boy centered on Greta (Lauren Cohan), a young American woman who takes a job as a nanny in a remote English village. Things get dicey after she discovers that the family's 8-year-old is actually a life-sized doll that the parents treat as a real boy that serves as a coping mechanism for the death of their real son from 20 years prior. Even though the movie wasn't particularly well received, currently boasting a 28 percent approval rating on Rotten Tomatoes, it did reasonably well at the box office, grossing $64 million worldwide, working from a budget of just $10 million. In many ways, this move makes sense. It's nothing new for middling horror movies to be given sequels, but looking at what New Line has done with the Annabelle franchise, why not try and mirror that to some degree? And who knows? Annabelle: Creation was a huge improvement on its predecessor. Maybe The Boy 2 can do the same. The movie is set to begin production in January, once William Brent Bell finishes filming Separation. No release date has been set as of this writing, but late 2019 or early 2020 seems likely. This news was previously reported by The Hollywood Reporter.